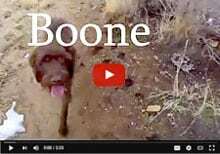 Maintaining healthy hips and joints is vital for dogs missing their spare leg. But with so many arthritis supplements on the market, how does one know which is best for their dog? Anyone looking for all natural homeopathic hip and joint pain relief for their dog should consider Arthro-IonX™ All-Natural Dog Arthritis Formula. But don’t take our word for it, please Call VETiONX Toll Free: 877-255-2909 for complete details! VETiONX has a full line of safe and effective homeopathic pet health care products to help your pet restore natural balance for maximum quality of life. Arthro-IonX is a liquid-based, proprietary homeopathic/oligotherapeutic complex that you simply add to your pup’s water dish daily. Arthro-IonX is invisible in water and fast-acting in your pet’s body, without causing negative side effects. Veterinarian Dr. Charline Wilson recommends Arthro-IonX every day. Call VETiONX toll free (877-255-2909) to find out why. Arthro-IonX is a homeopathic blend specifically formulated to temporarily relieve the symptoms associated with arthritis, hip dysplasia, and/or joint sprains, strains, or injuries. 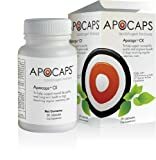 All ingredient claims are based on the Homeopathic Materia Medica and our ingredients are listed with the Homeopathic Pharmacopoeia of the United States. 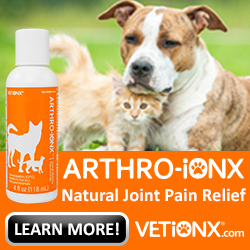 Utilizing a three-tiered approach to relieve arthritis pain in pets, Arthro-IonX promotes natural healing. VETiONX begins with an organic trace mineral complex (oligotherapeutic blend), which becomes the stabilizing base for our proven homeopathic ingredients. They then imprint vibrational technology into the final product to ensure your pet enjoys the agility nature truly intended. Buy 3 and Get 2 Free! Stock up and save on Arthro-IonX with free shipping. VETiONX publishes plenty of testimonials and success stories from customers and offers a 60-Day Satisfaction Guarantee. 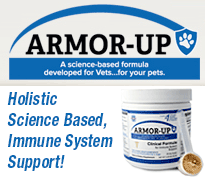 Have you used Arthro-IonX for your dog? Leave a comment below to let others know what you think! Please visit the VETiONX website for information about Promaxol homeopathic pain relief for dogs, or call 877-255-2909 to speak with a specialist. Promaxol safely and quickly treats your dog’s pain, and helps supplement your dog’s diet with the organic repair nutrients most dogs are missing as a result of modern lifestyles. It is a liquid-based, proprietary homeopathic blend that utilizes a multi-directional process to naturally relieve pain in dogs and support optimal recovery, energy and overall health. Thanks for shopping with the Tripawds Nation. Every purchase made here helps to keep this community running. We are being compensated for helping spread the word about VETiONX, but Tripawds only shares information we feel is relevant to our readers. VETiONX is not responsible for the content of this article.